Year 3 and Year 4 ‘Takeover Woodhorn’ day is a huge success! The whole of Key Stage 2 were involved in visiting Woodhorn Colliery this week as Year 3 and Year 4 led a ‘Takeover day’ at the exhibition centre. They took coal mine models, diary writing, a home made proggy mat and showcased their ‘Talk for Writing’ stories and songs from their studies this term based on the ‘Who do we think we are?’ topic. Around 50 parents came along too and the children were delighted to have some relaxation in the afternoon using the seasonal ice skating rink that we had booked for our exclusive use. The children learned how difficult it is to use ice skates! We have received requests from other teachers, who were at the event now want to come to CVPS and learn more about the innovative way we have developed our curriculum. It’s nice to be trailblazers in what we do with our children to help others to enjoy similar benefits. always we are extremely proud of our children and the staff who support them so well. usually show such good eating habits and manners when at school! Lots of compliments were also paid to our lovely Chef Lynn and her team. A huge thank you to all our parents for your overwhelming support with our Family Christmas Dinner this year. We hosted 150 adults who enjoyed a delicious Christmas turkey dinner with all the trimmings. Staff are looking forward to theirs after school this Friday where we will be presenting Chef Lynn and the kitchen team a token gesture of our appreciation for their amazing efforts in the kitchen. We have been really encouraged by parental feedback about the fantastic singing that took place at our Christmas carol services in school.The children were able to showcase the songs, including duets and solos that they have learned. We were also able to hear readings, Christmas poems and news about Christmas around the world. Thanks especially to Jenny, Melissa and Lisa for leading the services. All the children were thoroughly proud of themselves, and rightly so. We were delighted this week for Seth, Maisie and Emily in Y6 who all achieved their Grade 1 piano. A special well done to Maisie who achieved a merit for her exam. Thanks to Jenny for all the encouragement, nagging and school piano lessons that helped the Y6 piano students to succeed! 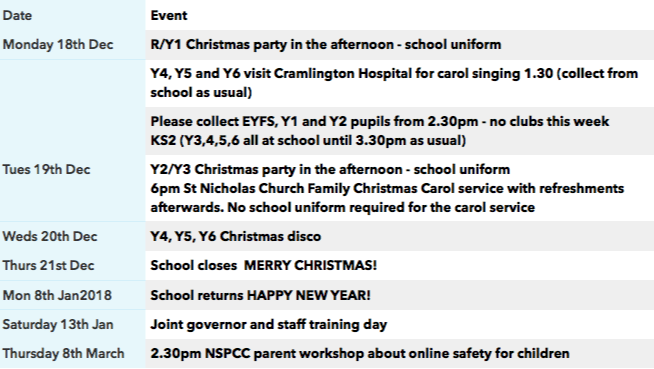 All pupils EYFS, Y1 and Y2 finish at 2.30pm this week. Please collect from the EYFS gate. Congratulations to Y5 this week who win extra playtime. This week at school I have conducted our usual half termly lesson observations which has been a real privilege. The progress the children are making in their books has been really encouraging to see. I’ve also seen examples of excellent practice in every class and we are very excited about the topic for next half term which is titled, ‘How does the world inspire us?’ We have consulted with the children and the range of themes we’ll be studying in the new year include a focus on Asia by Year 5 and Year 6; Africa studied by Year 3 and Year 4; Oceana studied by Year 2 and Year 1/2; and Northumberland by Early Years. There’s a host of excitement about the staff team as we finalise our plans for trips, what legacies we will leave, and what showcases we can perform. unkindness towards individual children which we would define as bullying. Please speak to your child’s class teacher in the first instance if there are any concerns about your child so that they can resolve any issues as early as possible, but if you have a serious concern please don’t hesitate to contact the school office to speak to me as school principal.